We'd wager a hefty sum that you've never seen one of these before - a build-it-yourself stereo speaker kit. 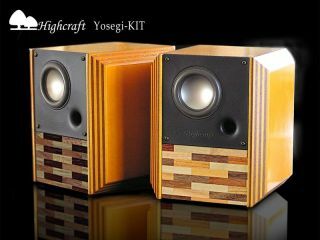 Moreover, coming from audio specialist Highcraft , the Yosegi-Kit speaker system is guaranteed to produce a quality sound; assuming you can manage to get it together, of course. The JPY30,000 (£129) set includes all the parts required to build two speakers that output 15W each - wooden enclosures decorated with traditional Hakone Odawara mosaic work, oscillating boards, titanium magnets and the various electronic components that do the spadework.